There’s no question that the cloud is here to stay. Organizations ranging from Netflix to NASA now rely on the cloud for their day-to-day operations. There’s no question that the cloud is here to stay. Organizations ranging from Netflix to NASA now rely on the cloud for their day-to-day operations. Both in our personal lives and in business, the convenience, portability, and accessibility of cloud services have played a major part in increasing efficiency and decreasing costs when it comes to storage and collaboration across the globe. But while the cloud may be an excellent solution for many situations, it’s far from perfect — especially for the enterprise market. Relying on the cloud means leaving infrastructure and security in the hands of third-party companies, which can lead to downtime and breaches that lie beyond the IT department’s control. 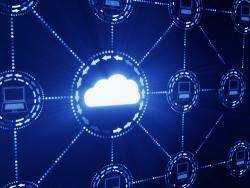 In fact, according to a recent study, 73 percent of IT executives across the globe worry that cloud services are hiding performance problems. Deciding between the convenience of the cloud and the control of on-premises infrastructure can be a major headache for IT departments. But in reality, the best solution is rarely choosing one over the other. For most organizations, hybrid is the way to go. Collaboration. When Sega was looking for a better solution to develop and test video games among its developers throughout the world, it turned to the hybrid cloud. Sega’s alternative deployment solution took advantage of the simple, cost-effective collaboration the cloud has to offer while still allowing employees to develop offline when needed. Hybrid helps a company save on bandwidth when working with large files and allows employees to work offline even when they have a poor (or nonexistent) connection. This way, collaboration can actually mean working together rather than waiting on another person to complete work. Customized security. There are plenty of cases where security comes second to accessibility. The cloud is great because it allows employees to access files wherever they are — from virtually any device — without costing IT too much time and money. But in business environments, there’s other data that is sensitive enough to make security the primary concern. A hybrid solution lets companies keep private files behind a secure firewall and only on the devices of their choosing. This limits access to the people who need it while still allowing less sensitive data to be shared freely. Flexibility. For business, a one-size-fits-all solution is rarely perfect. IT departments must take various factors into account when deciding which departments would benefit from being offloaded into the cloud and which need to stay on-site. These factors include price, security, and even the company’s in-house expertise. Hybrid solutions allow IT managers to customize their deployment models to fit their company’s needs. Hybrid solutions open up whole new avenues for IT departments. They allow companies to maintain control over elements that are most important to them while offloading the burden of less sensitive data to the more cost-effective and convenient cloud. By adopting a hybrid solution, IT can have their cake and eat it, too.